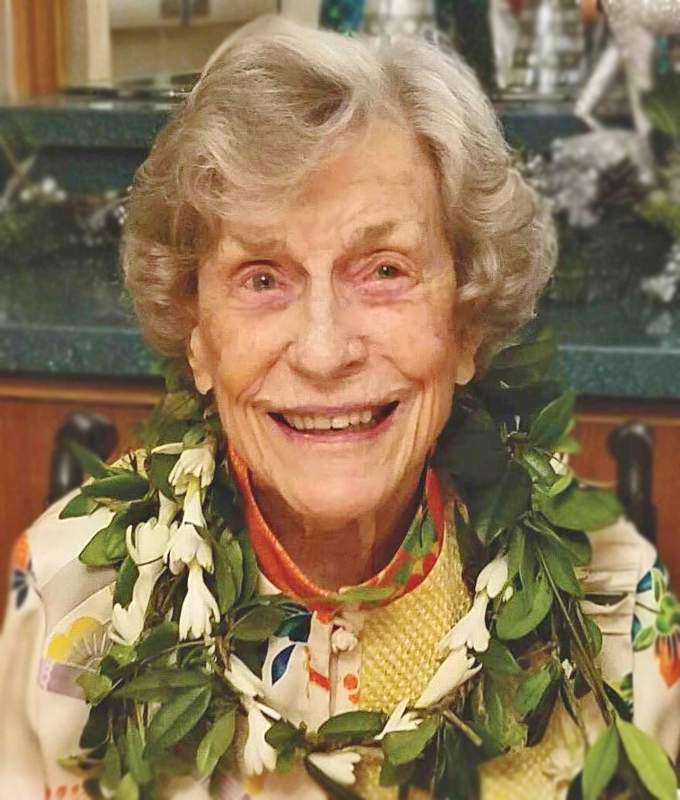 100, passed away peacefully on Monday, February 25, 2019, at her home in Honolulu, Hawaii. Elizabeth was born in Honolulu, Hawaii on December 11, 1918. She was the daughter of Mr. and Mrs. Irwin Spalding of Honolulu, and the widow of Anthony Burnham Boynton. She was a fifth generation descendant of Josiah Spalding who arrived in Hawaii in 1840. Elizabeth attended Punahou School in Honolulu and Scripps College in California. For many years she was an active volunteer in the community while raising three children in Kailua, Oahu. She is survived by her brother Irwin (Sonia) Edward Spalding of Camden, Maine, her daughter Elizabeth "Lee" Hoxie of Maui, her son Peter (Tracy) Starbird Boynton of Kailua Kona, two Grandchildren, Robert (Susan) Hoxie and Lisa (Maxwell) Hunter and hanai Grandson William Boynton, four great-grandchildren, and five nieces and nephews. She was predeceased by her son David Spalding Boynton of Kauai. Elizabeth was a very curious and caring person who enjoyed a variety of activities including foreign travel, French classes, art work, symphony, and particularly engaging conversations with everyone she met. A recent comment by a friend and caregiver is so true "I will always remember her beautiful smile and vibrant energy. We had such great conversations together". And this is at 100 years oldstill so interested in what others had to say. "She was generous of spirit, of time and of compliments" and also had a great sense of humor which often put friends and acquaintances at ease in challenging times. She was full of enthusiasm and Joie de Vivre. At her request, no public service will be held. Donations may be sent in her memory to the Koke'e Discovery Center Association, David Boynton Scholarship written on the check, 5213 Sokei Road, Kapaa, HI 96746, Daughters of Hawaii, The Contemporary Museum, and others of your choice.